Paul and June welcome you to this traditional English village pub. Enjoy a drink in this traditional village pub. There is always a choice of Three real ales available. The ever-popular Greene King IPA and guest ales available always on tap. If lager is your preference there's always the choice of Carlsberg or Fosters , Cider with Aspalls and Strongbow and bottled beers to suit all tastes. 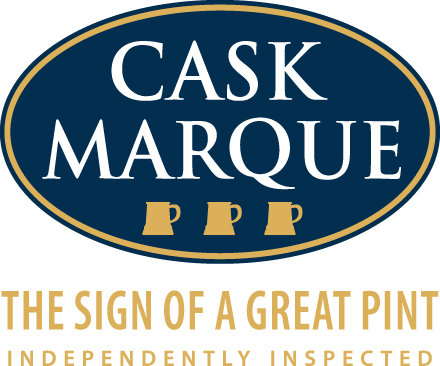 By keeping our ales in tip top condition we have been awarded the 'Cask Marque' Award. John Keats Russet red of autumn leaves. The noble aroma of the Hersbrucker provides a light hoppiness and fresh spice. Sweet caramel from the rye crystal malt and soft mellow fruitfulness in the finish. A light and fruity golden ale brewed with a blend of UK, US and Famously "tempered over burning witches", Holy Grail was originally created to commemorate the 30th anniversary of Monty Python. Monty Python's Holy Grail is a light golden beer with a fresh, zesty taste and a long crisp bitter finish. It's brewed with a mixture of hops, including WGV, which gives the beer a light fruity nose. It's a real tongue pleaser. Lots of people say they like this fine ale because it's well balanced with a refreshing, hoppy flavour and a clean, bitter finish. The hoppy aroma and flavour is created using two varieties of English hop – Challenger and First Gold. The brewers add the hops to the copper by hand and by blending in pale, crystal and black malts he balances the hops with the richness of the malts. The refreshing flavour of Greene King IPA makes it a great accompaniment to spicier foods and curries (though it's always nice simply enjoyed with friends.